Holograms of hydrometeors as they exist within the sensing aperture of the instrument. 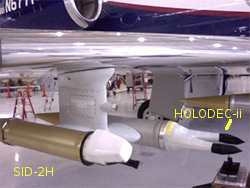 The HOLODEC-II is a second-generation version of a holographic detecter designed to determine the size, two-dimensional shape, and three-dimensional position of hydrometeors via digital in-line holography. Advantages vs other hydrometeor detectors are that the sample volume is not size dependent, relative positions of hydrometeors in the sample volume can be determined in three dimensions, and effects produced by shattering from the aperture edges can be identified and eliminated. Automated analysis programs have been develop to process the holograms collected and produce size distributions. 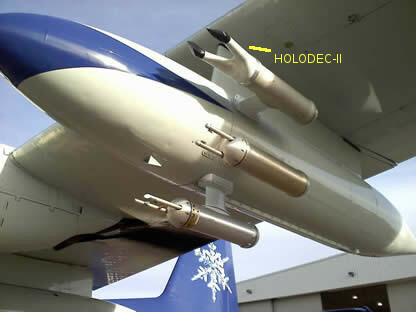 HOLODEC-II has sufficient resolution to determine the sizes and locations of cloud droplets as well as ice crystals. Detailed documentation is sketchy, especially for processing algorithms.